The idea of traveling fascinated Tanahu’s Renuka Thapa from her school days. She started traveling as a school student, attending excursions and educational tours. While on her visit to Pokhara, she was captivated by the gestures of travelers carrying cameras and bulky bag packs. She then dreamt of living a similar life. As Ashad is the most favorable month for Monsoon trekking, the female guides are currently occupied. To enjoy the monsoon thrills in the mountains, a throng of national and international travelers swamp Pokhara. International tourists mostly require tour guides. 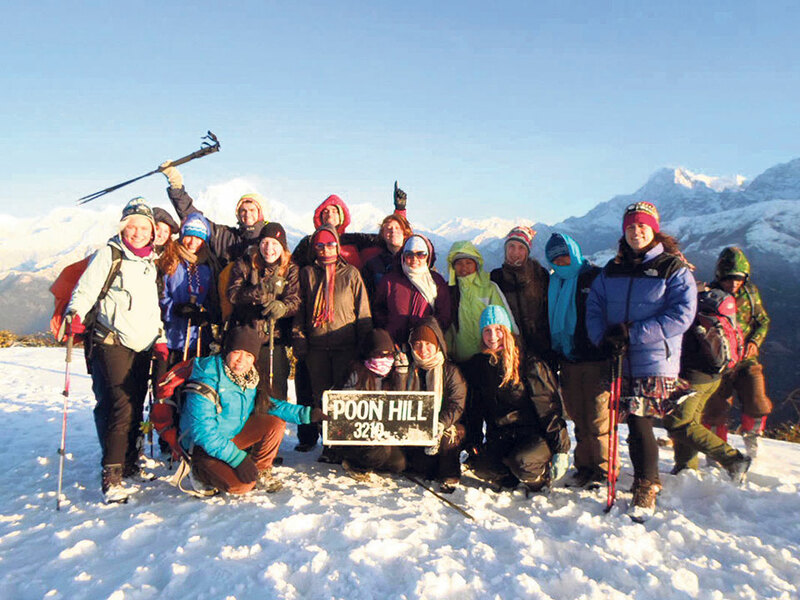 In groups comprising female trekkers, the tourists prefer female tour guides. As a result, the demand for female guides is on the rise. To work as a tour guide, it is not necessarily mandatory for one to have a high academic qualification. It is, however, essential to be able to maintain smooth communication with the trekkers. It is, therefore, possible for many females to be able to work as guides. Nonetheless, females holding higher degrees in Pokhara have also engaged themselves as a tour guide. Tila Rokka of Syangja is among many who are engaged in tour guiding. “Working as a tour guide, you get to travel places, know about many things, and are financially sound as well. There is also a wider scope for females wanting to work in this profession,” she added. Like other professions, many female tour guides state that the occupation also has its own drawbacks. While trekking, one can face food and accommodation problems. During peak seasons, the guides need to find alternate shelters in dining halls of the hotels, or in makeshift tents. Trekking lasts anywhere between three days to a month, depending on the circuit. Although female guides are at times treated with disbelief, the tourists prefer to have female tour guides. Jumla’s Sushila Acharya takes pride in fighting the stereotypical mindset. “Any physically sound woman can carry out the same task as a man can,” added Acharya. It is a changing trend for a woman to be working as a tour guide. 11 years back, three sisters – Lucky, Dikki, and Nikki Chhetri – had to compete against men. The three sisters claim Pokhara of being the first place to officially initiate tour guide training, and hiring female guides. “The female tourists facing certain inconveniences in absence of female guides drew me in the profession,” says Lucky. On popular demands of the tourists, the three sisters, and other tourism entrepreneurs started providing training to other females. Including Shobha Pariyar, Gam Maya Pun, Yasodha Baniya, Saraswati Pariyar, Lal Maya Pun, there are more than one hundred female tour guides, in the age bracket between 18 to 49 years.